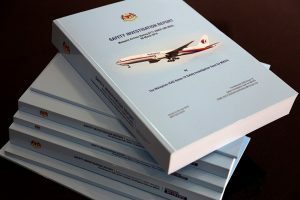 Originally described as the “Final Report” the Malaysian Government change the name of the report issued last night to reflect its inconclusive findings and the fact that the airliner has still not been found. Monday’s 449-page report offered little to solve modern aviation’s biggest mystery — and stopped short of apportioning specific blame. There’s nothing to suggest the plane was evading radar, or evidence of behavioral changes in the crew, it said. Significant parts of the aircraft’s power system, including the autopilot function, were probably working throughout the flight, the report said. The report conclude that Malaysia Airlines Flight 370, missing since 8th March 2014, was probably steered off course deliberately and flown to the southern Indian Ocean. But if the action was deliberate then who was responsible. At this point the report has no answer. MH370 was en route to Beijing from Kuala Lumpur with 239 people on board. Investigators have never been able to explain why the jet abandoned its route shortly into the flight, completed a u-turn back over Malaysia and then cruised south towards its end in the Indian Ocean. If ATC had noticed and responded to the change of direction of MH370 it is likely that the airplane would have been successfully tracked and followed. Next of kin of those onboard looked distraught after receiving the report, many sobbing and saying that it offered them “no closure”, and some claimed that information in it was incorrect. The search must continue until the airliner is found and her secrets revealed.